All patients registered at Brinnington Surgery have a named doctor who has overall responsibility for your care and support. Your registered GP is also your named accountable and your allocated GP. Your allocated GP will be responsible for the provision of your healthcare. If you choose to see another doctor at the surgery you are entirely free to go on doing so exactly as before. 2 x other forms of ID if you do not have any photo identification. Our GMS 1 registration form can be downloaded from the Registration Forms section of this page, or ask reception for a paper copy. 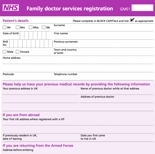 You will be asked to complete a Patient Registration form and will then be registered with the practice. You will also be asked to complete a new patient questionnaire and will be offered an appointment for a health check with one of the nurses. The questionnaire contains important information which will help us to look after you until we receive your medical records so please give us as much information as possible. The Doctors are happy to see patients who are temporarily resident in the Practice area should urgent medical care is required. In this instance persons wishing to be treated should state that they are a temporary resident requiring immediate and necessary treatment when reporting to reception. 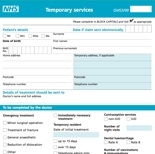 For non urgent problems, we strive to accommodate patients who are temporary resident in the Practice area but we may not always be able to do so on the same day if there are no routine appointments left. In this case, we would either offer a routine appointment in near future or provide a list of local practices whom you may wish to contact.